Updates were provided during the meeting on several other projects, including the Coleman Jewett memorial at the farmers market, finalists for artwork at Argo Cascades, and a plan to add an artistic element to the city’s new bike share program. 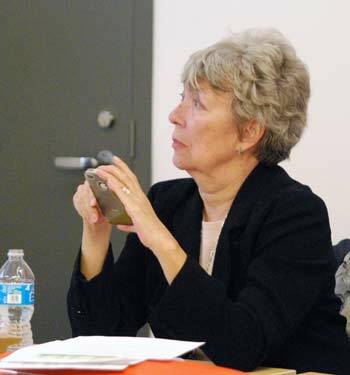 Deb Gosselin, who manages the city’s capital improvements plan (CIP), attended AAPAC’s meeting on Oct. 23 to review the CIP process. 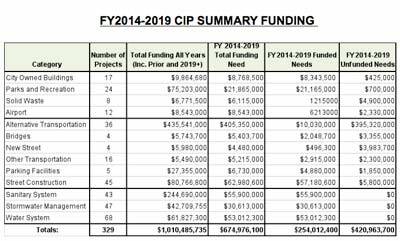 [.pdf of CIP for FY 2014-2019] She had previously briefed the commission at its Feb. 27, 2013 meeting, prior to changes in the way that the public art program is funded. Since then, the city council has eliminated the Percent for Art funding mechanism. That happened at the council’s June 3, 2013 meeting. 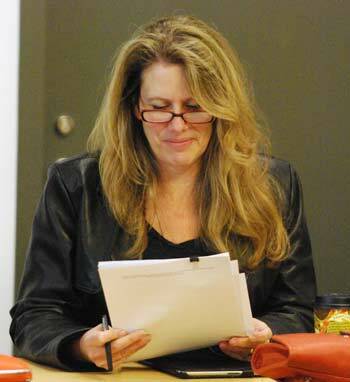 Deb Gosselin, who manages the city’s capital improvements plan, attended the Oct. 23 AAPAC meeting. Now, city staff will work to determine whether a specific capital improvement should have enhanced design features “baked in” to the project – either enhanced architectural work or specific public art. The funding for any of the enhanced features would be included in the project’s budget and incorporated into the RFP (request for proposals) process for the capital project. Required by state statute, the CIP must be developed and updated each year, looking ahead at a six-year period, to help with financial planning for major projects – permanent infrastructure like buildings, utilities, streets and parks. It’s intended to reflect the city’s priorities and needs, and serves as a guide to discern what projects are on the horizon. More than 300 projects are part of the CIP, including both projects that are funded as well as those for which funding hasn’t yet been identified. The document must be approved by the city’s planning commission, not the city council. 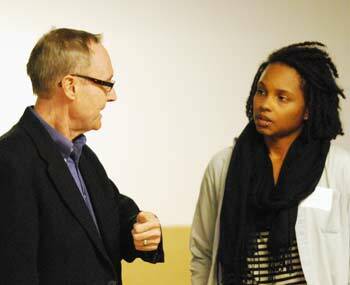 The planning commission approved the most recent CIP at its Dec. 18, 2012 meeting. The city council then uses the CIP in its budget planning process. In her Oct. 23 briefing, Gosselin noted that the CIP schedule now affects when the city makes decisions about public art. She told commissioners that Aaron Seagraves, the city’s public art administrator, had looked through the CIP to find projects where it might be appropriate to incorporate public art. Gosselin reviewed the CIP process, and described the decision-making matrix that’s used to help city staff prioritize capital projects. [.pdf of CIP prioritization matrix] She said the matrix is a tool that AAPAC might want to modify and use for its own decision-making on projects that might incorporate public art. Seagraves indicated he’d work with Gosselin to draft a similar matrix for AAPAC. In theory, virtually any of the capital projects in the CIP could incorporate public art, Gosselin said. To do that, AAPAC would first need to identify a project in the CIP and request that it be enhanced, she explained. Although the planning commission is charged with approving the CIP, the city council is the entity that approves the budget for specific projects. For capital projects that the city council has already funded for fiscal 2014 and 2015, it’s too late to build a public art enhancement into the budget. However, Gosselin noted that AAPAC could decide to use funds from the previous Percent for Art program that are unspent, and apply those funds toward capital projects that are already underway. Beyond that, now is the time for AAPAC to look at items in the CIP starting in fiscal 2016, as projects that could potentially be enhanced with public art. In AAPAC’s annual report that’s due to the city council in early 2014, commissioners should flag projects that commissioners would like for the city to enhance, Gosselin said. AAPAC should also identify a specific budget amount that would need to be added to the project, in order to cover the public art enhancement and maintenance. That budget enhancement requires city council approval. The lead time also helps managers of capital projects to work with designers and artists from the very early stages, she noted. 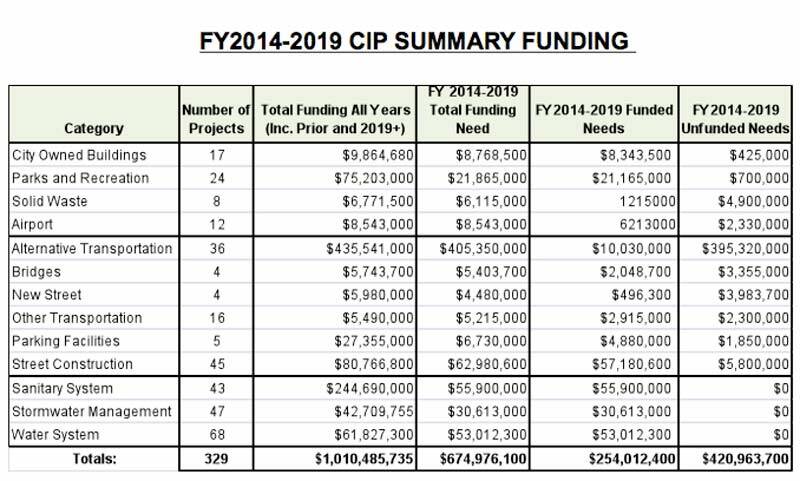 Summary chart of projects in the 2014-2019 Ann Arbor capital improvements plan (CIP). Connie Brown wondered about setting a public art enhancement budget at such an early stage, when it might be difficult to know how much is required. How much flexibility would there be to increase the amount at a later date? Deb Gosselin acknowledged that since this process of incorporating public art is new, it’s a bit hard to know how it will work. She thought there will likely be some flexibility, but the public art estimated budget needs to be as close as possible to the actual amount. “You’re in essence saying ‘Give me a budget and I’ll figure out what to do with it later,’” Gosselin said. Craig Hupy, the city’s public services area administrator, noted that it’s not unusual for a capital project’s budget to change dramatically, from the time it’s first entered into the CIP to the time the budget is approved by the council. If the project is slated for Year 6 of the CIP – that is, six years in the future – it’s not as critical for the budget to be as precise. For projects in which public art is part of the design process, Gosselin explained that the public art budget would be incorporated into a project’s construction contract, which would require city council approval. But if the artwork is conceived of as a standalone piece, it might have its own separate budget, with separate council approval. Hupy described two approval thresholds: (1) when a capital project is approved, with an estimated budget; and (2) when a specific construction contract is approved for that project. “That is where the final release of money comes from,” he said. John Kotarski wondered whether it would be appropriate to suggest a specific genre of public art when AAPAC recommends an enhancement – like a mural or street stamping. Hupy replied that it depends on the timeframe. A more general suggestion would work for projects that are in Year 6 of the CIP, he said. But for projects that are closer to being built – in Years 1 or 2 – then AAPAC should be more specific about what it would like to do and how much it would cost. Farmers Market enclosure ($90,000). Possible public art incorporated into design. Stadium Boulevard reconstruction from Hutchins to Kipke, including sidewalks ($3.84 million). Possible artwork on new retaining wall. Springwater subdivision street reconstruction ($2.18 million). Possible standalone artwork. Annual sidewalk repair program, citywide ($9 million): Possible sidewalk stamps. Seagraves plans to meet with managers for these projects, to get more details about what the projects will entail. Ashlee Arder clarified with Gosselin that any public art budget would be added to these existing budgets. Gosselin noted that some capital projects might have multiple funding sources, which means that public art enhancements might also draw from multiple funding sources. Hupy cautioned that some projects have a funding “twist” in that they might be funded in part with federal, state or county dollars. “And they will say no to art – that’s not their purpose,” he said. Connie Brown said she didn’t feel like she could make a decision on this project right now. She wanted to evaluate it in concert with other projects that AAPAC is considering, rather than take a piecemeal approach. Because AAPAC would be looking at long-term projects in the CIP, Brown proposed holding off on a decision about the roundabout until the broader context was clearer. John Kotarski said he tended to agree with Brown, but he thought that it might take a longer time to put together the broader context. He said he felt comfortable moving forward with this project, because the proposal contained the level of detail that he had asked for. He thought AAPAC should start moving forward with some of these projects. Commissioners discussed whether they could reverse their decision, if they approved it now but later decided that there were other projects that should take priority. Brown wondered what the impetus was for doing it now. Bob Miller replied that it was brought to AAPAC as a project and it was “smiled upon.” Craig Hupy, the city’s public services area administrator, pointed out that construction of the roundabout was finished, and it’s “not going to pick up and move anywhere in the next six months or six years.” He indicated that AAPAC could take some time to make a decision. Marsha Chamberlin weighed in, saying that if AAPAC takes two or three months to develop its prioritization matrix, modeled after the CIP matrix, then they’ll have a more objective, defensible way of approaching the selection of projects. After further discussion, Kotarski moved to table the roundabout item until AAPAC’s February 2014 meeting. Outcome: Commissioners voted to table the item until their February 2014 meeting. By way of background, at AAPAC’s June 26, 2013 meeting, commissioners had approved setting up an exploratory task force for possible artwork in the Arbor Oaks Park, located in the Bryant neighborhood on the city’s southeast side. [.pdf of Arbor Oaks intake form] Task force members include public art commissioners Malverne Winborne and Nick Zagar; Derek Miller, deputy director of the nonprofit Community Action Network (CAN); and CAN board member David Jones, as well as local residents. The task force has met twice. Aaron Seagraves, the city’s public art administrator, reported that the ideas being discussed all focus on having some kind of community project with a lot of involvement from residents, similar to the approach taken for the mural in Allmendinger Park. The problem, he noted, is funding. There is currently no clear funding source from the city, but a grant is available from the community foundation. The deadline to apply is Nov. 15. Marsha Chamberlin expressed some concern about the time it would take to write the grant application. 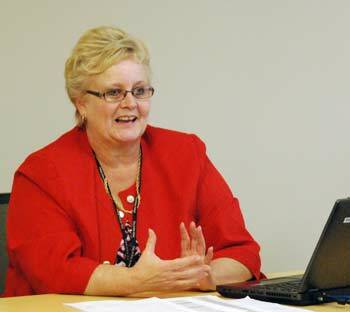 She noted that Seagraves was being asked to do a lot, and his position is only part-time. Craig Hupy, the city’s public services area administrator, indicated that the Arbor Oaks project was a very valuable investment in a part of the community that some people view as underserved. Chamberlin replied that she wasn’t against the project, but she wanted commissioners to be aware of how Seagraves is allocating his time. Hupy suggested that other city staff could help Seagraves complete the application. Responding to a query from Connie Brown, Seagraves reported that no matching funds are required from AAPAC. Outcome: Commissioners voted to approve application for the $40,000 grant from the Community Foundation of Southeast Michigan. Ashlee Arder, who was appointed to AAPAC in March of 2013, put forward a proposal to schedule a retreat. The purpose would be to create a forum for commissioners to get to know each other better, as well as to discuss the creation of AAPAC’s annual plan. John Kotarski and Ashlee Arder. Commissioners were supportive of this proposal. The discussion focused on whether to have a facilitator and how formal it should be. Arder said she’d conceived it to be relatively informal, but she could see the advantage of having a facilitator. This idea is to share each commissioner’s skill sets and personal interests, and tie those into the goals of AAPAC. “Let’s get together and figure out what we’re doing and who we are,” she said. 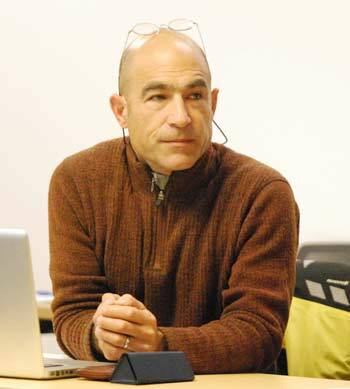 There was also discussion about a venue, with Arder advocating to hold it at a location other than AAPAC’s usual meeting spot – which is a basement conference room at city hall. Craig Hupy, the city’s public services area administrator, reminded commissioners that the retreat would need to be posted and held in a place that’s accessible to the public, in order to comply with Michigan’s Open Meetings Act. Outcome: Commissioners voted to set a retreat for Wednesday, Nov. 20 at 4:30 p.m. at a location to be determined. Ashlee Arder also proposed creating a community engagement committee to develop strategies for program participation, resident input and public art education. Kotarski urged Arder to join the outreach committee, and asked her to withdraw her resolution. She agreed, and talked about the kind of work she hoped to do, which in part involves bringing together a “curated team” from different sectors of the community to develop ideas for fostering public art as well as the broader creative sector. She intends to bring forward a formal proposal about this effort at a future meeting. Outcome: Arder withdrew her resolution to create a community engagement committee. Several other projects were discussed briefly during the Oct. 23 meeting, by way of updates. These projects were either already in progress when the city council temporarily halted spending on public art late last year, or don’t use Percent for Art funds. Here are some highlights. Do not use this site to submit a proposal for Canoe Imagine Art. Applications are on hold awaiting resolution by the City of Ann Arbor as to the best way to handle submissions to Canoe Imagine Art. If you plan to submit, enter your email below and we will notify you as to how to submit a proposal. 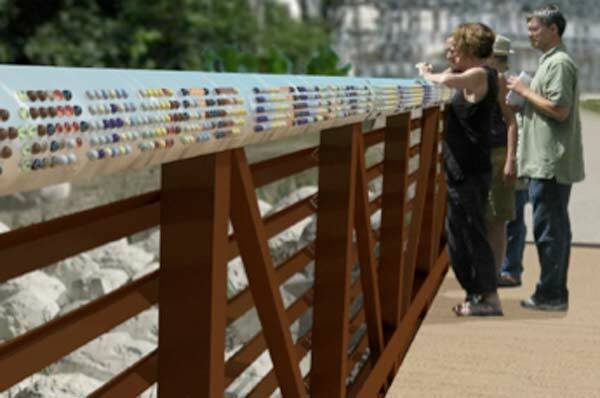 Rosen-Queralt is proposing artistic embellishments on the bridge railing, as well as a drinking fountain with similar embellishments. 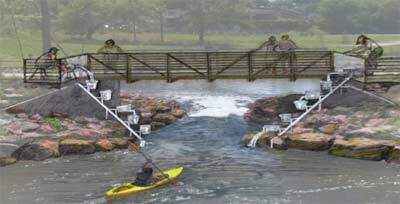 The proposal by Harries and Heder is called a “bucket cascade,” and would involve an interactive feature that allows people to operate pumps – using a pedal device on the bridge – that would draw up water from Argo Cascades and send it cascading back into the river. Rendering of Bucket Cascades proposal by Mags Harries and Lajos Heder. 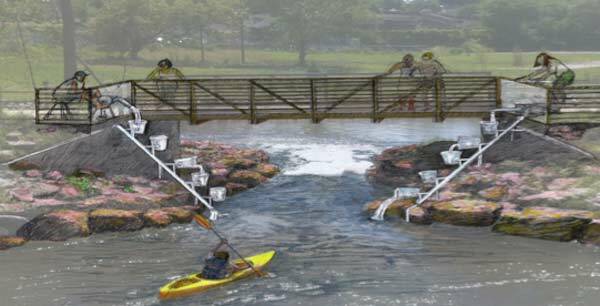 Rendering of proposal by Jann Rosen-Queralt for Argo Cascades bridge. There is currently a survey posted on A2 Open City Hall to solicit additional input. Seagraves reported that John Kotarski and Bob Miller will be attending the meetings of other city boards and commissions to make presentations about these two proposals and to get feedback. The task force will then make a recommendation to AAPAC, which will in turn make a recommendation to the city council. Marsha Chamberlin wondered how much difference it makes to do the kind of outreach that Kotarski and Miller are undertaking. They made a similar effort before the task force made a recommendation for the artwork at the East Stadium bridges. Connie Brown explained that there’s a broader purpose – to help people understand the process, and to create opportunities to engage others in the city’s public art program. Kotarski recalled that when he and Miller attended a Ward 2 meeting, it started out fairly confrontational. But by the end, residents seemed to better understand the process and support it. He said the outreach will help enhance and support the task force’s decision. The new design incorporates glass paneled louvers with tree images in three locations on and under the bridge, to connect the locations thematically. Widgery is still revising her design, according to Seagraves. It would need to be reviewed by AAPAC and get final approval by the city council. Ashlee Arder reported that she’ll be working with the Clean Energy Coalition, the University of Michigan and the Ann Arbor Downtown Development Authority to figure out how to incorporate an artistic element into the city’s new bike share stations. The CEC is managing the bike share program, with a targeted launch of April 2014. Arder said she was hoping to learn more about the bike community, and to develop some partnerships for this project. In addition to bike stations on UM’s campus, potential stations in Ann Arbor could be located at: (1) Ashley & Liberty; (2) Fifth Avenue & Library Lane; (3) Liberty & Division; (4) Kerrytown, at Detroit & Fifth: and (5) South State & Hoover. At their Aug. 28, 2013 meeting, commissioners had approved Joshua Wiener‘s schematic design for public art at a planned rain garden, to be located at the southeast corner of First & Kingsley. [.pdf of staff memo, including itemized budget] Wiener is continuing to finalize designs, for installation in the spring. His proposal is for sculptures showing the outlines of five fish. They’re small mouth bass, in different sizes, made of white epoxy-painted steel and pointed toward the Huron River. The largest sculpture will be just under 8 feet tall, 20 feet wide and about 5 feet deep. Two of the fish will be large enough to serve as benches. A memorandum of understanding has been negotiated between the Jewett family, the city, and the Ann Arbor Area Community Foundation, which will act as a fiduciary for fundraising. The plan now calls for two full-sized replicas in bronze, at an estimated cost of $15,000 each. The total budget is estimated to be $30,000 to $35,000. At AAPAC’s Sept. 25, 2013 meeting, commissioners voted to allocate $5,000 of AAPAC funds to help kick off the additional fundraising. On Oct. 23, Chamberlin reported that she’d be going to the Ann Arbor farmers market on Saturday to meet with vendors and describe the project to them. Each stall would also be given a donation envelope, she said, in the hopes of raising funds from vendors for the project. Commissioners present: Ashlee Arder, Connie Brown, Marsha Chamberlin, John Kotarski, Bob Miller, Nick Zagar. Also: Aaron Seagraves, the city’s public art administrator. Absent: Devon Akmon, Malverne Winborne. I filled in the Cascades proposal survey on A2 Open City Hall yesterday, and wow! a lot of the responses were so cranky! I would encourage Chronicle readers to fill it in if you haven’t already (and you probably haven’t; there were not quite 40 responses). It’s okay to be critical of the projects, just please don’t be cranky or borderline abusive.